Contamination in compressor supplied air can be a serious health risk. Compressor breathing air quality testing provides confidence to the Employer to provide a safe place of work, and to workers that rely on the system for air.The breathing air quality testing requirement for air supplied respirators is often one of the least understood elements ofcompressed-air-supplied breathingair equipment. Workplace Health and Safety Law requires that breathing air meet specified requirements and be tested to an agreed schedule as detailed in Australian Standard 1715:2009, Selection, Use and Maintenance of Respiratory Equipment. The warm, dark, moist environment inside a typical compressed air system provides the perfect conditions for micro-organisms to flourish and grow. Introducing this type of microbial contamination to food products is very risky and would be considered as a breach. It is not always obvious where the compressed air is contacting the food. Working surfaces like benches and conveyors are obvious and manageable contact points. However, air is invisible, and leaves no visible trace where it contacts the food, food contact surfaces, or the packaging. The quality of air required throughout a typical compressed air system will vary depending upon application. Treatment of the compressed air at only one point alone, for example the compressor room; is not enough, it is highly recommended that the compressed air is first treated prior to entry into the reticulation system (to a quality level suitable for protecting air receivers and distribution piping) and then at the point of use, with specific treatment being focused on the application and the level of air quality required. This approach to a whole system design ensures that costs are minimised and air is only treated on a needs basis and provides the most cost effective solution to high quality compressed air. 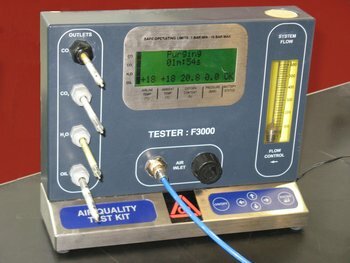 Compressor breathing air quality tests should be conducted to an appropriate schedule. In many situations annual checks are sufficient to show if there is any deterioration in the system. The frequency of testing should be reviewed dependent on the usage and results of the testing. 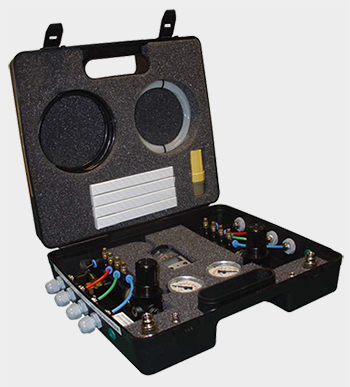 Onsite testing is conducted by our technicians using either Parker or the Dräger Breathing Air Test Kits, to determine the concentration of oil, water vapour, carbon monoxide (CO), and carbon dioxide (CO2) contained in the air that is delivered to workers or equipment. For advice on breathing air quality testing for your workplace call our office or use our contacts page to forward a request for further information.